I thought I would share my birth story now I am home and settled. DH and I headed into hospital for 11 am on the 25th to be induced. It was still a madhouse there (hence why they delayed me from going in on the Tuesday afternoon, as originally scheduled! ), but they managed to get me a room and settled me in to wait. The expectation was for a Foley’s to be inserted, with labour to start the next day, but after being inspected, they decided that I was dilated enough to break my waters and give me the hormone drip. However, I had to wait until there was a birthing room free, so they sent a doctor in to put the catheter in and take some bloods in case I ended up asking for an epidural or needed a CS. I had some lunch and not long after that, they came in and took me into the birthing room. I jumped in the shower before they did anything, since I couldn’t use water for pain relief during labour. 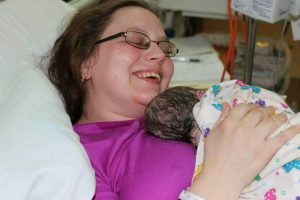 At just before 3 pm, the midwife came in and broke my waters. She headed off for a quick afternoon tea break, allowing some time to let things start to happen. Had a few mild contractions while she was gone, but nothing major. At just before 4 pm, they started my drip. My contractions rapidly increased in intensity, not sure on timing. I was sitting on the fitball, using heat packs and getting DH to massage my lower back during each one. They told me at one point that they would do an inspection at 8:30 pm to check my progress. Around 5:30 pm, I requested the morphine shot, but I was 7 cm dilated by that stage, so couldn’t have it. Back onto the fitball and back to DH massaging my back, no other pain relief requested. At 6 pm, my midwife went off to have a dinner break, and told me she’d be back in half an hour to see take back over. The midwife who took over from her rang her 20 minutes into that break and said “You might want to get back in here, we’re about to have a baby.” By that stage I was involuntarily pushing. My midwife got back in, her student came in too and got me up on the bed to see how I was going. I still had a lip of cervix, but they told me that I was able to start pushing and they’d see how it went. They did end up ringing the doctors to put them on standby at one stage, as after each contraction, bub’s heart rate dropped a bit. But by the time the doctors arrived to check, they were told that they weren’t needed – “We have a head”. After she crowned, three pushes later and she was placed on my chest at 6:54pm. We decided to delay cord clamping, so once it had stopped pulsing, DH got to cut the cord and I was given the shot to deliver the placenta. They were great with my request to view the placenta, and did their inspection of it right beside me, telling me exactly what they were looking at. I ended up with a second degree peritoneal tear, and had to wait quite a while on the bed for a doctor to be free to stitch me up. I lost a total of 480 ml of blood during delivery, which kind of worried DH, but didn’t need any blood to be given. 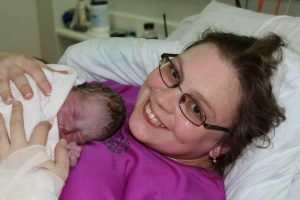 I feel so lucky to have had such a wonderful birth – my midwife was just wonderful and her student was equally wonderful. And DH was just as supportive and assertive as I thought he would be. I’ve been told though, given how fast this labour happened, even if it was induced, when number 2 comes along, I’d better be getting to the hospital the moment anything starts!!! It really was such a positive and empowering time. I’ve heard people say how labour really empowers women, and I really do feel quietly proud of myself. And even though I didn’t get to experience the spontaneous labour, at least I got to have the birth that I wanted. Oh, I did forget to mention that I did try the gas, however I didn’t use much of it, because I couldn’t stand having to keep the mouthpiece in. I think I used it for the start of 5 or 6 contractions, but I removed it before the contraction was over. After that, I just didn’t even bother trying it because it was just frustrating me. I used Fertility2Family products in late 2015 to assist conceive my first child. I found the Ovulation Tests extremely beneficial in predicting ovulation. I’ve just purchases more tests to help conceive our second child!